Anyone who has ever had anything to do with Scouting - Boy Scouting, Girl Scouting or Co-ed Scouting - will be familiar with the Scout Motto: Be Prepared! Thus it was that I had to prepare for and help to host the 11th Gulf Region Universities” Scout Camp organised by the United Arab Emirates University last week at a specially designed campsite near Dubai. Some might be asking how Scouting can possibly be a part of university life. The answer is that Rover Scouts “for late teens and young adults “remains a very popular social activity for many young people, especially in this part of the world, even for girls. 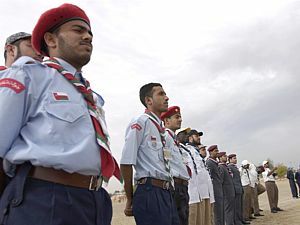 Nearly 300 young men plus nearly a hundred leaders travelled to the UAE Scout Camp, from Saudi Arabia, Qatar, Bahrain, Kuwait and Oman as well as the United Arab Emirates. Nineteen universities were represented and Scouts from all parts of the Gulf entered into the fun and activities with gusto. One of the interesting things about Scouting is that it builds very clearly from a tradition of purposeful activity as a vehicle for the development of life skills that are immediately transferable to daily life. Thus while 17-20 year olds in the West might be engaging in co-ed activities, dating and participating in mixed social activities, young men and women of Arabic and Islamic traditions are culturally expected and required to have no social relations until after arranged marriages. There will be those who might be tempted to make social and moral judgements about such behaviour. I prefer to accept it as simply different and not better or worse. It was certainly refreshing to find myself as a youth worker not having to worry about problems faced with other university-age young people elsewhere, like alcohol, drugs and male-female relations. Instead, coffee, tea and biscuits around a campfire, skits, sports and cultural activities prevailed. It kept thinking about the importance of good food and purposeful activity in child and youth care work. 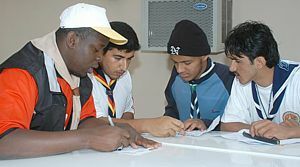 In the evaluations given by the Scout Camp participants, special attention was drawn to the importance of sporting activities, to the importance of particular learning activities directly related to their personal interests in Scouting, and to the value of cultural activities that enabled young people to share and learn from each other. How often do we find that sporting activities end up being little more than a time-filler and supervisory technique in child and youth care practice? What opportunities do we create for social skill development and practical learning outside classrooms? And what cross-cultural learning opportunities do we miss virtually every day by always emphasizing the common ground between members of a youth group as compared with celebrating their cultural differences? To what extent do we actually look beyond the cultural confines of our own particular centre or residence to explore cross-cultural learning activities that exist in the local community, and which equip young people to become more culturally competent and safe? Uniforms Come in Many Shapes and Styles! Such thoughts took me back to the Scout Motto: Be Prepared! It’s easy to react to the urgent matters - what Exupéry called matters of consequence - simply because we aren’t prepared to use opportunity events that are available all around us. Go for it!